Music, dancing, bar, food, auction items and fun, fun, fun! Everyone has fun at Mardi Gras, including our many sponsors who help make it happen. Please support those who help make Mardi Gras possible. Like to become a sponsor? Call us. Mardi Gras Fundraiser - 2019, Come Join the Fun! 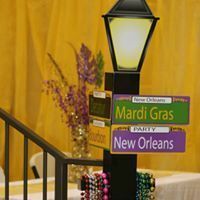 The Good Shepherd Parish Community is pleased to announce Mardi Gras on Saturday, March 2, 2019 (open to all ticket holders 21 years or older). This event has grown in popularity and community support over the last 30 years. The event will be held at Monterey Station in Cowan from 6 to 11 p.m. The night will feature live entertainment by The Respectables Band and DJ, who were awarded “Best Live Band in The United States” in 2013 by Wedding Industry Experts. Between sets the DJ will keep the fun tunes rolling and will keep Monterey Station rocking, and dancing the night away from 7 until the last dance at 11 p.m.
A silent auction featuring items donated by local and regional businesses will be available for your bid. Must be 21 or older to attend. BYOB not allowed due to liquor licensing laws. A cash bar will be available for your enjoyment.